Whilst it may not be the deciding factor we think it’s important to point out that the Rum Runner hulls can be fitted with optional seats – so they can double up as fast and efficient, low-profile sit-on-top kayaks. That means if you get tired of paddling standing up (which does require slightly different muscles) you can sit down instead. 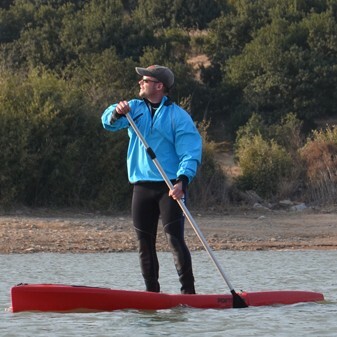 It’s also more stable to paddle seated if you’re in larger waves (as your centre of gravity is lower). And even if one of you doesn’t like stand up paddling, you’ve still got a boat you can both use. 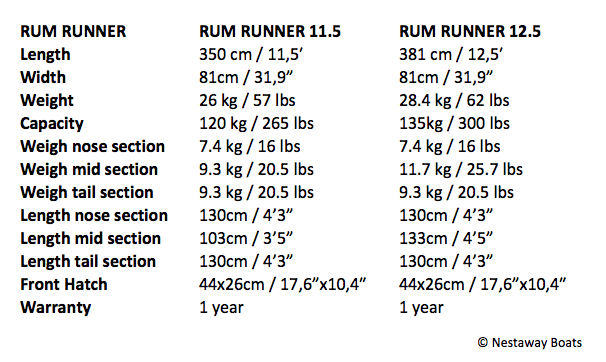 There are two sizes, the Rum Runner 12.5 and the Rum Runner 11.5. Both have the same bow and stern (front and back) sections, with the middle section determining the overall length. The deciding factor will be the size and weight of the paddler who uses the boat most often. If you’re over 80kg and/or about 1.75m, go for the big one (12.5). Paddlers of smaller stature will be able to use the 12.5 but by the time you get below 75kg or about 1.65m then the 11.5 will start to be easier. The larger model is more stable and ultimately faster (if you can put the power into the water), but slightly less easy to steer etc. 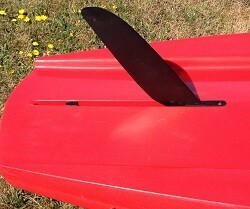 A skeg – the black plastic fin in this picture – is supplied as standard with UK boats. This gives great directional stability whether you’re stand up or sit down paddling your Rum Runner. It kicks up into the slot if you hit something or run aground, and can be held up securely (with a pin through the top) for transport etc. The bow and stern sections are only 130cm (4ft 3″) long, with the middle at 103cm (3ft 5″) for the 11.5 model, and 133cm (4ft 5″) for the 12.5. Maximum width for all sections is 81cm (2ft 8″); heaviest is 12kg. We haven’t had many opportunities to try the Rum Runners in different cars yet. But from our experience with the Point 65 Tequila sit-on-top kayak – which has larger sections – we would expect the Rum Rummer to fit in most hatchbacks of VW Golf size and up, and possibly some cars from the next class down. All our Rum Runner SUPs are equipped as standard with a kick-up skeg, non-slip standing area, rings for attachment of kayak seat, and hatch in bow compartment for storage of clothing and valuables. If you want a kayak seat consider Point 65’s own very comfortable, pneumatically adjustable AIR seat, as fitted to the Tequila kayak – please contact us for pricing. NB. Collection from our premises is free (Christchurch, BH23 4FN). Delivery is possible but quite expensive at around £50 (inc VAT and insurance) to most UK mainland addresses (please call first to check).